If you are a fan of the Chuck TV show then check out this Buy More logo t-shirt. You can get this Buy More t-shirt in styles for men, women, and kids and it is available in many sizes and colors. On the Chuck t-shirt you can see a big Buy More logo with a green background with a shopping cart on it and the stores name Buy More below it. So now you can feel like an employee of Buy More or just a big fan of chuck as it is a cool t-shirt an if your girl likes to shop a lot then maybe this would be the perfect present for her. If you are a fan of Chuck then this t-shirt could be just what you need. 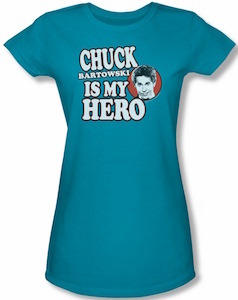 The t-shirt is available in men, women’s and kids styles and all of them have a picture of Chuck on it and the text “Chuck Bartowski Is My Hero”. This officially licensed t-shirt is perfect for the true fans of Chuck that are looking to honour their super spy by wearing a t-shirt of him. And maybe you can even as a family all wear the same fun Chuck Bartowski t-shirt while watching reruns of you favorite TV series Chuck. If you like Chuck then you of course will love this travel mug that has the logo on if of the Buy More. A white travel mug with the green Buy More logo just looks stunning and for sure lots of people will not understand what this mug is all about but when you do run into a fan of Chuck then you know because they will understand the product just like you do. This Chuck travel mug is made from durable stainless steel and is double walled and insulated so that your coffee to go will be staying warm for longer then that ugly paper cup. In your Buy More mug you can put up to 16 oz. of you favorite drink and it’s great for at home, work and on the go. Imagine one night while you are watching Chuck on TV or just think back of the great night when it was on TV you get cold…..
No worries this fleece blanket will get your warm and is Chuck themed to. 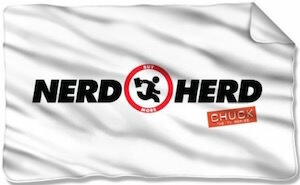 This white fleece blanket is 36 x 58 inch and has the Nerd Herd logo on it with the little running geek in the middle and below that at an angle the Chuck logo to. Now napping on the couch or sleeping in bed will be warmer and way more fun and that all thanks to this Chuck Nerd Herd blanket. This t-shirt shows Chuck Bartowski and it comes in many fun colors for men and women. Do you like Chuck the nerd turn super spy? If you do then this is the t-shirt for you. On the shirt you can see a drawing of Chuck sitting down with his hands fold together and below the image you can see the name of the character and the show “Chuck”. Now it’s up to you to pick a color, style and size and you are ready to show the world that you really liked watching Chuck and still peek back at some amazing episodes. Chuck is one of those people that can be nerdy and save the world. 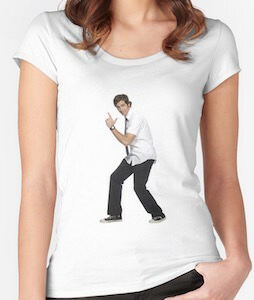 And now there is a t-shirt that shows Chuck Bartowski like a real spy but holding up his fingers instead of a gun. It’s just a fun t-shirt with a photo of chuck and this t-shirt comes in men and women’s styles in many different colors and sizes but all besides the heather grey are made from 100% cotton. Unfortunately Chuck is no longer being made but that should not mean you should stop telling the world how fun he is and watch him even more in reruns. There we have Chuck Bartowski as we all know and love him the geek that worked at the Buy More. Now you can have you own Chuck as figurine. This Chuck figure is 7.5 inch tall and is not a toy just a display piece that looks just like your favorite spy. The Chuck figurine has great details like the shoes he wears and the pocket protector and he is even holding a barcode scanner. He is standing on a base that looks to me like a computer part and it has the logo of the show on it. Lets keep Chuck in our memories and it is a log easier if you got your own Chuck Bartowski Figurine. 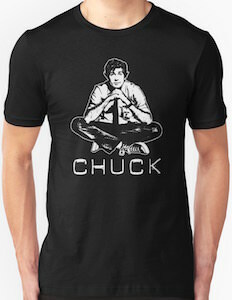 If you are a Chuck fan then you will love this t-shirt. 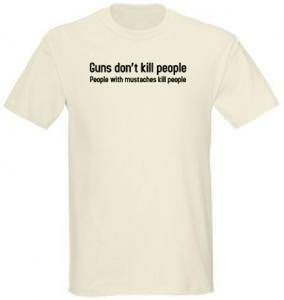 On the front of this t-shirt you will find a saying from the cool television show Chuck “Guns don’t kill people, People with mustaches kill people”. A simple quote is all you need, other Chuck fans will definetly love this t-shirt aswell. Made from 100% cotton making this a very comfortable long lasting t-shirt, available in sizes Small, Medium, Large, XLarge, XXLarge, XXXLarge and check out the many different colors and styles you can get this classic quote on. If you have seen Chuck then you know his he also uses Charles Carmichael as an alias. And after he left the CIA he started a business for himself (and his friends) calle Carmichael Industries and this is the t-shirt that they have at Carmichael Industries. 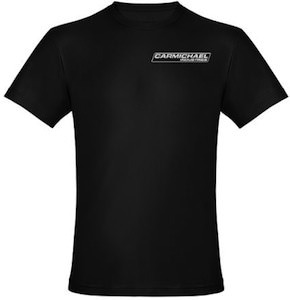 This dark t-shirt is simple and just has the Carmichael Industries logo on the right side. Of course this Chuck t-shirt comes in different styles and even some other colors. People who watch Chuck know this scene. The little figure funning with his little briefcase while being shot at so that bullets holes appear besides him. A true Chuck fan would love to have this scene and now you can just get it for on your fridge. 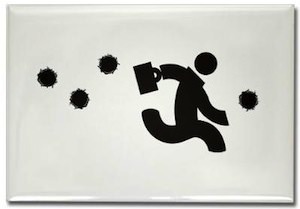 This is a fridge magnet with the running Chuck and the bullet holes.